ZOTO mobile recharge is here again with bonus recharge offer for airtime, data and services like DSTV , GoTV subscriptions and other payment services via the ZOTO mobile app. Zoto Mobile Recharge has been around for sometime now and it is a new and innovative way of earning up to 50% recharge amount, and the fastest mobile recharge platform in Nigeria according to Vipul Sharma, Founder & CEO, Zoto. "The current referral program will be ending on Sunday. Here are the details of the new referral scheme to start Monday morning. To take advantage of the ongoing N500 referral promo, be sure to refer friends and get them activated before Monday!" √ Install and open the ZOTO app, register and use a 4 digit password that you can remember. √ During the registration, tick I have a referral then input OGUNTW as your refferal. √ Next, click on apply coupon code and input ZOTO100 (for first time recharge, gives 100% bonus), or ZOTO50 in the space provided. You will be given 50% discount. For example, if you want to recharge #100, when you use the ZOTO50 recharge code, you will be charged N100 but N50 (50% of N100) will be added to your ZOTO wallet. √ Since its your first time of using ZOTO recharge, you will be asked to provide your ATM card details (the long numbers in front of your ATM card). Don't be afraid because ZOTO is safe and secure and giving out your card details to ZOTO won't harm you in anyway. Note - All transactions involving money tranfer from your bank via ZOTO recharge requires an OTP that will be sent by your bank to your mobile phone number for confirmation, without the OTP you can't make any transaction. So don't get scared of loosing your money in the bank. √ ZOTO will ask for the OTP code from your bank, input it and your mobile line will be credited within 5 seconds. After that it will ask for your ATM card CVV ( last 3 digit number at the back of you Card), just input it. √ After successful first recharge, you will be given free N500 in your ZOTO wallet. 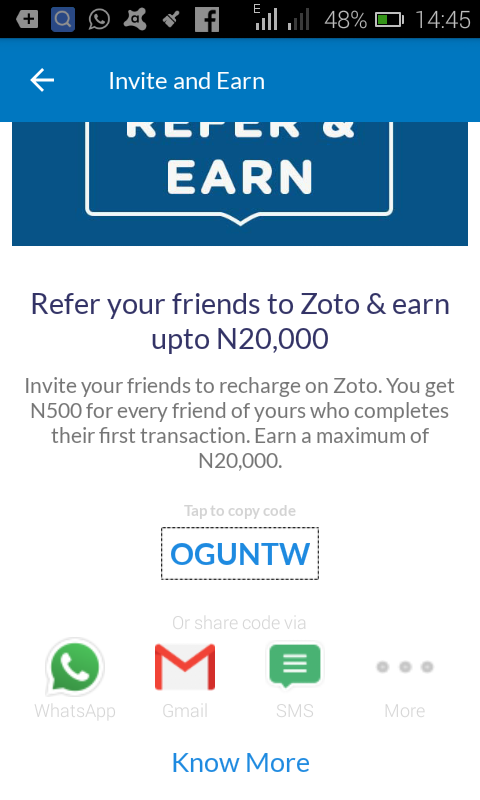 You can now make use of your referral code to invite people to join ZOTO, you get N500 for each recharge. I have been using ZOTO for about 8months and its the best recharging app to get free airtime in the country with best bonus ever. With ZOTO recharge, you get free N700 weekly and with this current referral program, you can make up to N10,000 within 3 days (ends midnight Sunday June 4, 2017).